Greetings to each of you as we fall into October! These cooling temperatures give me chills, chills like those you might get when you attend our Organ Spooktacular. Many of our young members and several of their teachers, plus a few chapter members, are preparing pieces to be part of this program. I’ve heard the Phantom of the Opera may make an appearance, along with a performance of Bach’s Toccata and Fugue in d minor, plus other festive selections. Be sure to invite a neighbor and a young pianist to attend, and join the spirit of the event by wearing your Halloween costume! Whether it’s by “trick-or-treat,” there will be a spooky reception to follow. A big thank you to members and friends who attended the opening Hymn Festival. Even when the organ took an afternoon off, the music, choir, hymns, and readings made the event a success. A huge thanks to Howard Webb, new Wichita AGO member, for directing a wonderful volunteer choir. Volunteers joined us from Plymouth Congregational, First Presbyterian, and Cathedral of the Immaculate Conception. Also to Rev. Thomas Hallstrom and Rev. Karen Robu, for leading us in the words crafted together by Susan Palo Cherwien. And if you haven’t heard, the organ is working again after one of the five power supplies was replaced. 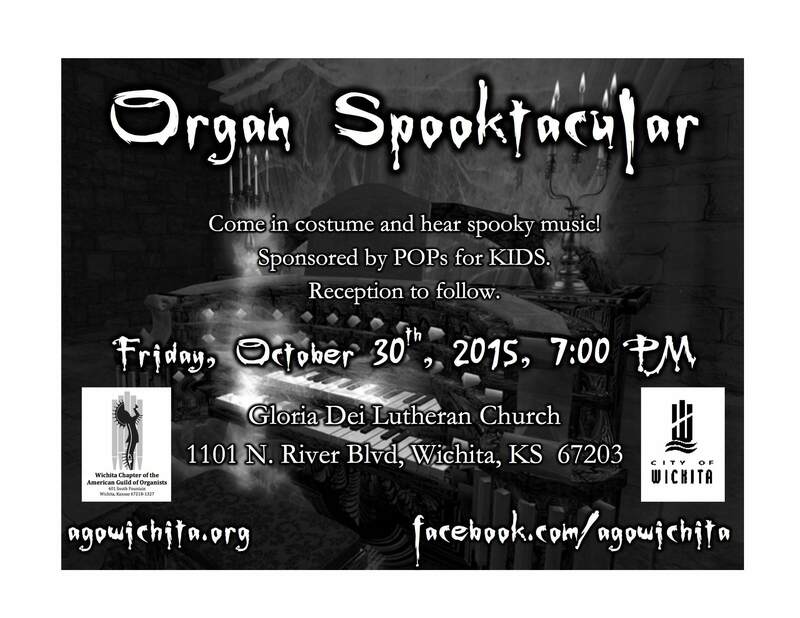 I hope to see you in costume at the Organ Spooktacular!